Charity Poker is the latest Fundraising phenomena! If you've got a tournament planned, or you've already had one we want to hear from you. 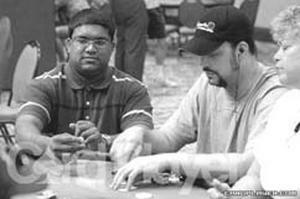 Guyanese poker player, Anand 'Victor' Ramdin, ranked 7th in the world poker ratings, won $1.8 million US dollars and will be donating a portion of his winnings to Guyana's First Lady Varshnie Jagdeo. Her Kid's First Fund 'Heart to Heart Campaign' is currently underway and with the money will take 13 children and 4 adults from Guyana for heart treatment in India. **for more information on this or to read the entire story click here. The event raised tens of thousands of dollars that will go towards research, education and outreach programs to be funded by the Foundation. Poker stars Annie Duke, Layne Flack and Phil Gordon all played in the tournament offering the shirt off their back [literally] as well as a prize of their choosing to the player(s) who could knock them out of the game. These Poker Pros show that Poker Cares about making a difference! For the second straight year in a row, Alice Cooper, "The King of Shock Rock," hosted his Celebrity Poker Tournament at his restaurant in Phoenix, Az. called Alice Cooperstown. 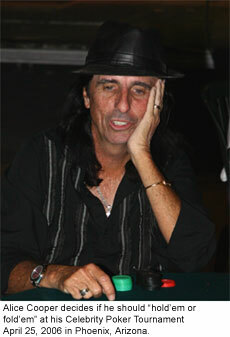 Many celebrites and amateurs came to join in the game to raise money for the Solid Rock Foundation of which Alice Cooper is the President of the board. The foundations mission is to honor Christ by providing financial assistance and help to teenagers and children in their community. 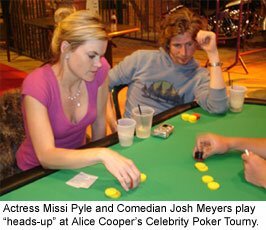 Of the celebrities that played, Missi Pyle (Dodgeball, Charlie and the Chocolate Factory) placed First, while Josh Meyers (Mad TV, Date Movie) placed Second in the tournament. For more information visit Alice Cooper's Solid Rock Foundation on the web. "Community of Giving" is a Registered Trademark of Digital Maven. All rights reserved.